Happy birthday to geekqueen! May your day be wonderful and your year to come be the very best yet. I am off bright and early this morning to Indianapolis to take part in a short conference. I will make my post tomorrow from my hotel! Links of the Day: The two links for today are Edward Gorey-iffic. Literature of the Day: This is a truly chilling poem. Don't miss the ending! That once she loved so well. Was it a breeze that passed? One day he hopes to get the child for his name letter (J) on his other arm. That is all kinds of amazing. And awesome. Please tell him so. I'm so glad you shared the picture! Thank you! "J is for James, who drank lye by mistake." 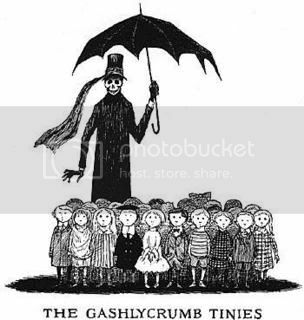 Much love for Mr. Gorey! I love him and Charles Addams so much, it's scary. They were Goth before Goth was cool. They were Goth before Goth was cool. Also, great poem. Thjs is the first time I've read it. Yay! I'm so glad you liked the poem. It's a great ending, isn't it? Damn, that's a gorgeous poem.